Written by Natasha M. Saltz, Esq. I remember shopping for shoes as a teenager, eyeing some red velvet platforms. It was the 90’s and I was trying a new “alternative” look. The salesperson looked at the two women I was with, assuming at least one of them had to be my mother, and asked my shoe size. My stepmom laughed and said she did not know, so the salesperson looked at the other woman with me. My dad’s first wife started laughing, too, and my stepmom really started cracking up, saying that was her wife-in-law. The salesperson was just confused, but I remember loving this moment so much. That my stepmom and my dad’s first wife had a special nickname for each other, and that they both loved me and wanted to spend time with me, made my usually grumpy teenaged heart full. From that day on, to join in the joke, I referred to my dad’s first wife as my stepmom-in-law. I grew up frequently spending weekends with my dad, my stepmom (his third wife), my stepmom-in-law and her new husband, and my older brother from the marriage between my dad and my stepmom-in-law. It was hard to explain to my friends at school Monday what I had done over the weekend, especially since divorce and the idea of "joint custody" was not common in my community, but it made me happy. I loved feeling that I had this big new style of family that was made just for me. I remember that for the first trip I took to Catalina Island, our odd group traveled over on my stepmom-in-law’s husband’s boat. Yes, my dad and his first wife took a weekend trip with their new spouses and with the child of my dad’s relationship with his second wife. When my dad passed away, it was that same boat that we used to scatter my dad’s ashes as a family. My mom did not join us on these adventures, but she always supported them. I know that she wanted to put the part of her life that included my dad behind her, but she was careful not to let her feelings get in the way of my relationship not only with my dad, but with the unique family that he gave me. When my dad passed away, my mom continued to drop me off at the halfway meeting point my parents used for custodial exchanges so that I could spend the weekend with my stepmom. For my college and law school graduations, my mom invited my stepmom and my stepmom-in-law to the parties she threw for me in our home, understanding how much I love them. She comforted me when my stepmom-in-law passed away. When my mom married my step-dad, who is one of six kids, and they had my two younger brothers, my extended family grew even further. I suddenly had a huge family of aunts, uncles, and cousins, and my dad fully supported my relationship with all of them. This month I’m traveling to celebrate my step-Grandma’s 100th birthday with them. I experienced the usual challenges of growing up, but because of these people I also grew up overflowing with love. I felt like there was no way that other people had as many people in their life who loved them, supported them, took responsibility for them, cared for them, and understood them as I did, and that made me feel so strong. I felt like no matter what I faced, I had so many people available to me, that at least one of them would be the right person to help me. Or, if no one could help me, I knew that I still had a lot of hugs coming my way. These experiences prepared me for my current relationship. My boyfriend has a child from a prior marriage, my thirteen year old stepdaughter. I’ve been in her life since she was five years old. Her mom has remarried, and my stepdaughter now has a stepbrother who is her age and a new little brother. We were not initially as close as we are now and it was a process to become comfortable with each other, but we all focused on patience, kindness, acceptance and the amazing healing abilities of time to create our own extended family. Now, my stepdaughter has what I had – mom, dad, stepmom, stepdad, stepbrother, new brother, multiple sets of grandparents, plus all of my extended family as her family. We have family dinners and celebrate important events together. Even though my boyfriend and I are not married, it was my stepdaughter who began to refer to me as her stepmom and my mom and stepdad as her grandparents. My stepdaughter’s little brother loves my boyfriend and so we occasionally babysit him and have him sleepover. Yes, that means that my boyfriend and I take care of his ex-wife’s young child from her new marriage. Which also means that my boyfriend’s ex-wife and her new husband happily have their young child cared for by her ex-husband and his girlfriend. Recently, we celebrated the Bar Mitzvah of my stepdaughter’s stepbrother and grieved the passing of my stepdaughter’s maternal grandfather. We are family and everything that means family now applies to us. Many people grow up in extended families – older siblings, grandparents, aunts, uncles all join in to raise children. And we all know the benefits of having that support system. It takes a village, right? But when it comes to the new partners of an ex-partner and their family, I see many of my clients becoming jealous, territorial, and angry. I know that the emotions are more complicated than with the traditional extended family, but if they are open to it, the benefits can be immense. I have known Laura Wasser for approximately ten years and I have seen firsthand her desire to change how people experience the divorce process. Or, at least, to remind parents to keep an eye on the other side and to choose to see continued co-parenting as just a new way of structuring a family. It does not have to be like the horror stories that people hear and assume are inevitable. This is a vision that I share with Laura, which is why I no longer litigate family law disputes and instead work with families through the collaborative process of mediation. It is also why I was honored when Laura invited me to share my personal story with it’s over easy. The hope is that by creating this non-traditional family for my stepdaughter she is feeling the love, strength, and confidence that I felt as a child. We believe that a child can never have too much love in their life, and when it comes to family, the more the merrier. I am so appreciative to all of the adults in our family. I know that there are difficult and complicated feelings, but we always proceed with respect and kindness. In those particularly difficult moments when we do not actually feel that way, we fake it. And that’s okay, too. Now, more than twenty years after that shopping trip, I have my own wife-in-law. I also still have those red velvet platforms. Natasha M. Saltz, Esq. is a family law attorney and certified mediator in Santa Monica, CA. 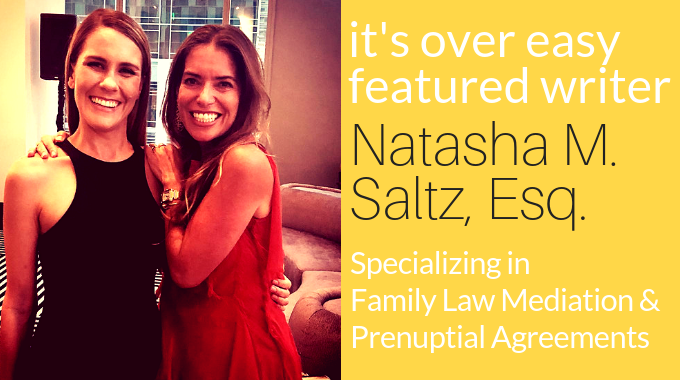 Prior to opening her own practice, she began her career as a staff attorney with The Harriett Buhai Center for Family Law and then as an associate attorney at Wasser, Cooperman & Carter, PC. She lives in West LA with her stepdaughter, boyfriend, and her two dogs, Toulouse and Bistecca.